Marilyn Manson was set to play in Toronto with Rob Zombie on Thursday night (July 26), but the shocker rocker bailed on his performance shortly before the show was set to begin. Due to unforeseen illness, Marilyn Manson will not be performing tonight in Toronto, ON. If you were in attendance specifically to see Marilyn Manson, your tickets will be available for refund at point of purchase. Rob Zombie will perform as scheduled. As you can see, he's blamed an "unforeseen illness" for the abrupt cancellation. 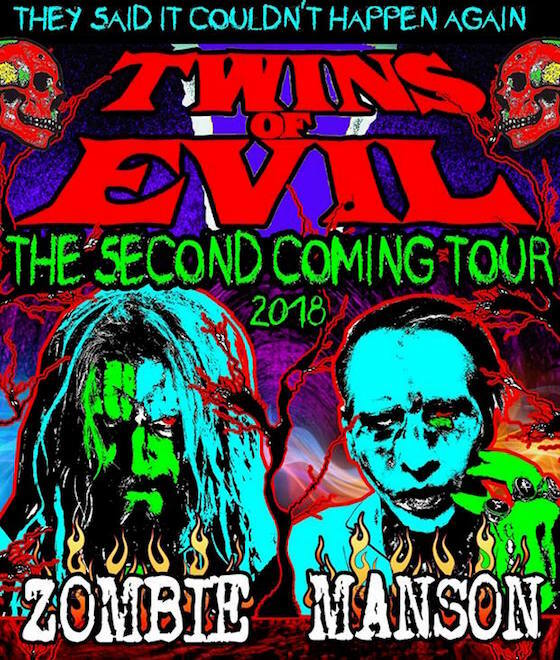 It's unclear at this point if any more dates will be affected on Manson and Zombie's joint tour, but you can see the upcoming schedule for the "Twins of Evil: The Second Coming" over here. UPDATE (7/27, 11:45 a.m. EDT): Down below, you can now watch a concert official deliver the news onstage about Manson not performing — something that the crowd is obviously not happy about in the least. Keep scrolling and you can also watch Rob Zombie try to make it up to the audience by playing Eurythmics' "Sweet Dreams (Are Made of This)," which of course Manson famously once covered. UPDATE (7/27, 10:30 p.m. EDT): Marilyn Manson has now issued another statement explaining that the reason he could not make the Toronto show was that he had the flu. He added that his Heavy Montreal show tomorrow will go ahead as planned. See his latest statement in the tweet below. Marilyn Manson was unable to perform on his and Rob Zombie's Twins Of Evil tour in Toronto last night due to the flu. Manson is recovering and is set to perform at all scheduled dates starting tomorrow at Heavy Montreal.